Bentamapimod (AS602801) is a novel and orally active c-Jun-N-Terminal Kinase Inhibitor highly specific for JNK kinases. The inhibitor Bentamapimod (AS602801) is a potent anti-inflammatory agent which has been shown to reduce the disease burden in several pre-clinical models for endometriosis, and has the potential to be effective in addressing the causes of post-operative abdominal adhesions. Pre-clinical data have demonstrated Bentamapimod to be an effective anti-inflammatory compound with anti-fibrotic properties. Bentamapimod (AS602801) showed good bioavailability in rats (F=50%). It does cross the blood brain barrier, with 98% brain penetration the drug has been well tolerated so far. 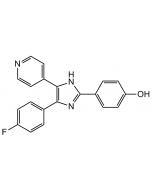 Bentamapimod (AS602801) is a potent and selective JNK inhibitor with therapeutic potential in MS and fibrosis as well.